Clandestine mail surveillance, if it wants to remain clandestine for very long, has to meet certain criteria. Three of the major ones are that 1) the personnel involved in the activity must be highly trained and capable. 2) In order to achieve ingress into and egress from the mail without leaving any telltale traces, the activity has to be supplied with the proper technology, things like specially-constructed steam pots, bifurcated "knitting needles" for attacking the flaps and capturing the enclosed letter, chemicals to expose secret inks and back-lit devices for seeing through the envelopes, to name just a few. 3) The activity must have easy access to the mail stream, if not outright control of it. In early Soviet times, the secret police qualified only on criterion #3. The Civil War still raged, the ravages of WWI were still very recent and postal communications were difficult if not at times impossible. Many towns and villages had been depopulated or their people were left homeless. Many addresses simply no longer existed, and even the post offices themselves were often damaged or destroyed; large amounts of postal equipment were unusable or missing. Many postal officials and workers had been drafted into the Army during WWI and had perished there or had gone over to the Whites with the advent of the Civil War. The great majority of the skilled "flaps-and-seals" officials that had worked in the Tsar's "black chambers" was not about to stick around and trust in the tender mercies of the people whose mail they had been opening. Odessa was a microcosm of the larger struggle, and it was a mess. The city had been fought over, occupied and re-occupied repeatedly during WWI and the Civil War. The Soviets didn't take final control of it until 1920. So, countrywide and locally in Odessa, some means of compensating for the failure to meet criteria #s 1 and 2 had to be found. Up to the late 1920s, by which time they had developed a better trained and equipped force of PK workers, they did it by means of steganography, using symbols on "post marks" to alert other sorters and secret police as to actions they should or should not take. Debate in the postal history community went on for decades as to the meanings of these markings. Even when in 1972 the truth came out from an official source, it did not become common knowledge and the debates continued up to the end of the 20th century. "In the difficult years of the Civil War, the [postal] administration was forced to hire poorly-qualified workers for its post offices on the periphery. On occasion, these workers weren't even sufficiently literate. So, to streamline mail processing, a variety of symbols started appearing on postmarks. For instance, a thick line with its ends cut slant-wise (in the form of a stretched-out diamond) signified that the letter had come from the field post; three small triangles meant that the letter had undergone censorship (bold face mine - SV), and so forth." Even after they had a more capable work force, however, the Soviet secret police still resorted to steganography in date stamps from time to time, at least up to the beginning of WWII. The date stamps discussed in this exhibit are properly understood as censor marks masquerading as postmarks, a form of steganography, because they fulfilled no real postal function. The "audience" for whom they were intended was the postal sorter on the secret police payroll or the political surveillance post (PK - politkontrol') down the line along whatever route the mail was to be sent. Thus far, researchers in the censorship field know of only three classes of these "steganographic markings" as they relate to Odessa: the so-called "three triangles," "izhitsa" and "zet" date stamps. 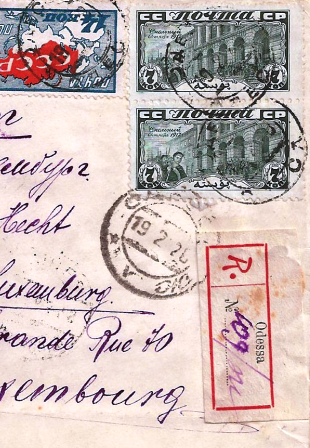 The "three triangles" markings were almost entirely applied to mail sent from the RSFSR to some foreign destination. At the very least they told another PK or postal sorter that "we have already opened, read and resealed this item of mail, so don't bother to do the same thing again and waste your time." These were censor marks in the truest sense of the word, although there was nothing in their text that could link them with censorship. The "izhitsa" and "zet" markings, however, were different. They were applied to incoming foreign mail, and they had to have had some additional connotations, perhaps something like "we have examined this item and we want you to keep tabs on the addressee by tracking his or her mail in your town," or "we have examined this item and we want you to put the addressee under physical surveillance." We don't know what the precise meanings were because that information is still classified by the Russian authorities, but we do know that the meanings could not have been exactly the same as those of the "three triangles" date stamps. This conclusion is reached by the simple fact that the "three triangles" markings as a class exist in great abundance. The "izhitsa" and "zet" markings, on the other hand, are rare, and extremely so for Odessa. From the meager record available, the "three triangles" date stamps appear never to have coexisted with the "izhitsa" and "zet" marks. Moreover, the latter two markings appear not to have overlapped in Odessa until around 1939-1940. Thus, they can be assigned to three distinct periods: 1920-1923, 1926-1930, 1939-1940. These periods are all shorter than those for "three triangle," "izhitsa" and "zet" markings from other towns and cities. "Izhitsa" and "zet" markings coincided much more frequently elsewhere than they appear to have in Odessa. The exhibit closes with the only "received in damaged condition" marking recorded thus far for Odessa. While it cannot be established beyond any reasonable doubt that this particular Odessa marking is evidence of clandestine censorship rather than a legitimate post office explanation for mishandling by sender or postal processes, so many of its cousins from other cities have been demonstrated to be fig leaves covering up for botched ingress into a cover that there is a strong likelihood this one is just such a leaf, too. This exhibit is part postal history and part censorship study, involving a considerable amount of detective work. Some of the points made in this exhibit are discoveries appearing for the first time. Most of the material shown here served as the basis for the article Clandestine Surveillance of Mail in Odessa from 1921 to World War II in the Rossica Journal, and incorporates subsequent discoveries. The three triangles material is generally common (with the exception of one type, which is exceedingly rare). The "izhitsa," "zet" and "received in damaged condition" markings are all rare to extremely rare. I. Audience One: Other Postal Sorters and Secret Police Entities. A. 1st period: The "Three Triangles" markings, 1920-1923. B. 2nd Period: "Izhitsa" postmarks, 1926-1930. C. 3rd Period: "Izhitsa" and "Zet" postmarks, 1939-1940. II. Audience Two: The Public. "Received in Damaged Condition" markings. - , Kontrol' mezhdunarodnogo filatelisticheskogo obmena (dokumenty), Ukrainskaya i Rossiyskaya Filateliya No. 1, 1991, pp. 49-51. ; [Ashford, P.T. ], Correspondence, British Journal of Russian Philately No. 39, October 1966, p. 30.; Baillie, I. and members of the Ukraine Study Group, Odessa Cancellations: the continuous double circle types, British Journal of Russian Philately No. 33, October 1963, pp. 18-22. ; Banfield, N.R., Three Triangles or Three Castles Postmarks, Pochta No. 8, June 1990, pp. 15-20. ; Carson, Michael, Three Triangle Cancellations, Pochta No. 9, Dec. 1990, p. 20. ; Ceresa, Dr. R.J., The Postal History of the Russian Civil War. Part 1 - The Three Triangles Ekspeditsiya Censor Markings, British Journal of Russian Philately No. 43, October 1969, pp. 14-23. ; Editorial Board, At the Sign of the Three Triangles, Rossica Journal No. 74, 1968, pp.68-69. ; Marris, H.Q., The "Three Solid Triangle" Ekspeditsiya Postmarks of 1921-1922, British Journal of Russian Philately No. 37, October 1965, pp. 19-20. ; Prado, Lt. Col. A., Three Solid Triangles, Rossica Journal No. 70, 1966, pp. 13-15. ; Rombaut, E., The Soviet Philatelic Association, Pochta No. 7, Dec. 1989, pp. 10-14. ; Seichter, Dr. R., Ekspeditsiya Postmarks with Triangles on Ukraine Cards and Covers, British Journal of Russian Philately No. 37, Oct. 1965, pp. 20-23. ; Shmuely, M., Soviet Censorship and Other Markings, Rossica Journal No. 112, 1988, pp. 17-40. ; Skipton, D., "Damaged" Mail and the Soviet Post, Rossica Journal No. 119, October 1992, pp. 44-56. ; - , More "Damaged" Mail, Rossica Journal No. 130, April 1998, pp. 47-58. ; - , The Three-Triangle Datestamps Revisited, Pochta No. 8, June 1990, pp. 21-23. ; Steijn, I. A Few (More) Thoughts on the "3 Black Triangle" Postmarks, Pochta No. 9, December 1990, pp. 22-25. ; - , Izhitsa (Bless You) and Other Conspiracies, Rossica Journal No. 138, Spring 2002, pp. 88-92. ; Vinokurov, A., Kontrol' pismennoy korrespondentsii v SSSR, (Surveillance of Letter Mail in the USSR), Filateliya No. 11, November 2000, pp. 42-44. ; Volis, Steve and David Skipton, Clandestine Surveillance of Mail in Odessa from 1921 to World War II, Rossica Journal No. 146, Spring 2006, pp. 72-76. ; Wortman, Dr. A.H., Moscow and Petrograd Ekspeditsiya 1921-1922, British Journal of Russian Philately No. 35, October 1964, pp. 14-15. ; - , The Three Triangles Ekspeditsiya Markings, British Journal of Russian Philately No. 44, December 1970, pp. 13-14.